Perfect arrangement of your things. Practical and aesthetic addition to your interior. Free-standing wardrobes along with the elaborate system of open closets and built-in wardrobes are designed to make the most of every space in the interior of your house. Every home needs adequate storage space for the actual clothing of its inhabitants as well as for other household equipment that must be organized and stored somewhere. This function is fulfilled by wardrobe cabinets, saparate wardrobes and other storage systems. The choice is limited only by space. 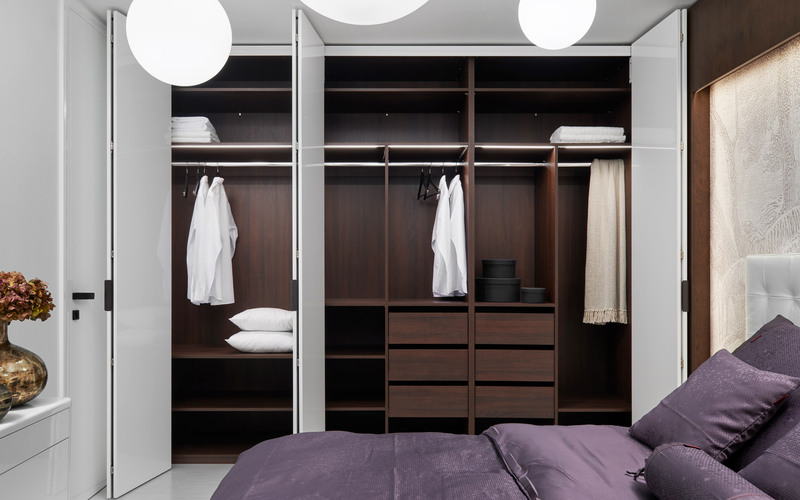 Wardrobes are available with sliding or side-hung doors. Door panels are available in surface finish of veneer, varnish, LTD, mirror and colourful glass. The front area of built-in wardrobes does not have to be necessarily in one decor; you can choose mirror, colourful glass or natural materials. Nowadays, there is a wide choice of handles both trendy and stylish. The handle you choose should correspond with the whole design of the wardrobe. Handles can be large and dominant, or unobtrusive. Some wardrobes can be fitted with elegant milled handles where the inner area can be veneered or varnished. Are you thinking of installing something in your wardrobe to make it more practical? Do you need a special hanger for trousers or ties? If yes, just go for it! But the most important part of your wardrobe are quality drawers, shelves and wardrobe bars. You can also take advantage of sliding and rotating hangers with easy access. Meanwhile, items that you use only seldom can be placed in boxes on a less accessible shelf.